Netherton goalkeeper Ross Ingram looks like he's punching Peterborough Sports reserve team defender Carl Bird in the face in this picture by David Lowndes. Ten-man ICA Sports clinched a final berth in the Hunts Internediate Cup on Saturday (January 14). The in-form Peterborough Premier Division side pipped Cambs League Division One outfit Bluntisham Rangers 2-1 away from home. ICA will play Cambs Premier Division side Eaton Socon in the final. Peterborough Sports Reserve team striker Karl Gibbs is the meat in a Netherton United sandwich. Photo: David Lowndes. Nathan Glover and Connor Pridmore shot ICA into a 2-0 lead at Bluntisham before the home side reduced the arrears after the break. ICA, who are unbeaten in their last six competitive matches, survived a red card for central defender Kane Gilbert. The big game in the quarter-final of the Peterborough League’s President’s Shield was won 3-1 by Netherton United over Peterborough Sports Reserves. The crack city sides are both chellenging for the top-flight title and two goals from talented teenage defender Lewis Brisbourne eventually sealed a 3-1 win for the leaders at the Grange. Ash Jackson had opened the scoring for Netherton with big Carl Bird equalising in the first minute of the second half for Sports. Netherton United's Ash Jackson fends off Ali Nyang of Peterborough Sports Reserves in their President's Shield quarter-final at the Grange. Photo: David Lowndes. Netherton are joined in the semi-finals by Ketton who pipped Deeping Rangers Reserves 2-1 thanks to goals from Lewis Morley and Jonathan Lawrence. The third tie scheduled for Saturday was abandoned after 48 minutes due to an injury to referee David Stapleton. Moulton Harrox were leading 1-0 at Wisbech Town Reserves at the time and the game is likely to be re-staged this Saturday (January 21), possibly at Harrox. 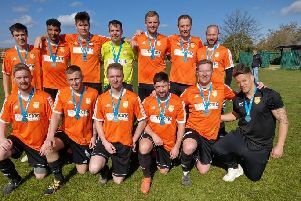 The final quarter-final between Pinchbeck United and ICA Sports at Knight Street is also due to take place this Saturday. Pinchbeck, who have a game in hand, moved level on points with Netherton at the top following a 2-0 win over Holbeach United Reserves on Saturday. Ollie Maltby and Tom Panton scored the goals. Elsewhere there as a baptism of fire for new Crowland manager Ian McIntosh as AFC Stanground Sports ended a six-game run without a win in some style. Sam Cross and Dwayne Rankin both bagged hat-tricks in a 10-2 romp with Chris Brown (2), Josh Staggs and Jack Dean also on target. It was only 3-2 at the break as Stephen Greenhalgh and Simkus Virginjuis scored for Crowland. Thorney are off the bottom of the table for the first time this season after securing an excellent 1-0 win at a Leverington side who had been on a decent run. Sam Rayner scored the only goal of the game. Uppingham are now bottom after a 5-0 home reverse at the hands of Sawtry. Zak Fisher scored twice for Sawtry. Stamford Lions were also 5-0 winners at struggling Stilton United. Neil Speck was on target twice. Pinchbeck United 2 (Maltby, Panton), Holbeach United Res 0. Netherton United 3 (Brisbourne 2, Jackson), Peterborough Sports Res 1 (Bird). Wisbech Town Res 0, Moulton Harrox 1. Bluntisham Rangers 1, ICA Sports 2 (N. Glover, Pridmore).